In architecture, as in medicine, those things of greatest interest are sometimes to be found on the inside. That certainly can be said of Ronald Reagan UCLA Medical Center. This is not to suggest that the new building - designed by the world-renowned architect I.M. Pei, his son C.C. Pei and Pei Partnership of New York, with the Los Angeles office of Perkins+Will as executive architects – is not a good-looking structure. The 1-million-square-foot Ronald Reagan UCLA Medical Center is handsomely dressed in a suit of 18,000 travertine panels. Abundant exterior public spaces such as plazas and courtyards invite communal inter-action. Sunshine floods through large diamond windows, a signature of Pei design, and ceiling-to-floor glass to drench the main foyers in light. The interior is crisp and clean, with white-paneled walls, terrazzo floor and 15-foot-high coffered ceiling. An elegant, curving staircase to the lower floors punctuates the main lobby, and the long corridor that links the building’s three primary entrances - Ronald Reagan on the east, Stewart and Lynda Resnick Neuropsychiatric Hospital at UCLA on the south and Mattel Children’s Hospital UCLA on the northwest - is faced in rich honey maple. Yet the first impression of a building, however attractive, is only one dimension of architecture. And for those who will work - and those who will heal - inside, it is not necessarily the most-important one. If we are looking for the design document that tells us why Ronald Reagan UCLA Medical Center is out-of-the-ordinary, the floor plan of the patient floors is a good place to start. At first glance, that floor plan seems little more than a functional diagram: a square doughnut with fan-shaped spaces on three sides and an M-shaped space on the fourth. Those odd shapes turn out to be more than a designer’s caprice. The quarter-round fans are patient clusters that bring an optimal number of patient beds within view of the nurses' stations. 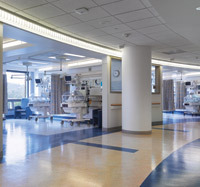 The M-shaped floor is the intensive-care wing of each floor, and here again the odd outline of the floor is about making patient beds more visible, and closer, to caregivers. The floors are all about functionality and efficient use of space. Architecture is about making spaces pleasant and humane as well as functional. Natural light is the major strategy here to humanize the modern hospital. The typical hospital of yesteryear had long, dark corridors that often ended in a shadowy corner or dead end. Patient corridors were double-loaded, with patient rooms on either side, like the hallways of a hotel. 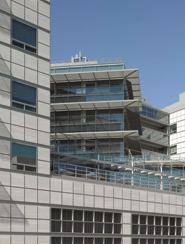 In Ronald Reagan UCLA Medical Center, on the other hand, the corridor spaces are comparatively short, and single-loaded corridors called "clusters" replace the conventional, double-loaded halls. When elevator doors open to each patient floor, visitors face a window. Hallways, rather than dead-ending in shadow, culminate with a large window that brings both light and the outside world into the space. The combination of simple organization, compactness and attractive views makes the new medical center easily navigated. It's simple for visitors, who are often emotionally stressed and easily confused, to find their way, and that is humanizing. The abundance of natural light is another expression of humane values, reflecting recent research that suggests that views of sunlight and greenery help in healing. Says C.C. Pei, co-principal of Pei Partnership, "We worked hard to create a design that not only meets the project's technical and scientific goals but also creates an environment that is cheerful, inspirational and intimate, despite its large size." freedom to design the building the way you want to," says Richard Azar, an architect and the head of transition planning for the project. "When UCLA made the decision to hire the likes of the Peis, it was a commitment to bring the design up to the next level. And because of our success, future projects are likely to emulate this one." C.C. Pei downplays somewhat the challenges of the project. "I wouldn't use the word difficult" to describe healthcare design, he says, "but it is complex. You are taking all these diverse pieces of information and constraints and finding a synthesis, something that addresses all of them." The most-interesting challenge, perhaps, was to design patient and treatment rooms in ways that anticipate the development of new medical technologies. If architects cannot predict the future, the best they can do is to design for optimal flexibility. Working with Pei Partnership - and providing most of the interior design as well as completing the programming for the hospital - was the Los Angeles office of Perkins+Will. Standard patient rooms, too, are flexible and, if the need arises, can be converted to intensive-care rooms. For the sake of versatility, patient rooms in intensive-care clusters are free of clutter. Lights and other equipment are suspended from the ceiling in the form of booms that can move up, down and side-to-side with little effort. Likewise, there is little clutter in the operating rooms. Essential equipment is suspended from overhead, while there is little on the walls beyond TV monitors. A wall in the OR is set aside for "plug ins" if surgeons or other caregivers need power or data for additional equipment. The history of hospitals has evolved from almost prison-like buildings to places like Ronald Reagan UCLA Medical Center, where the comfort of patients can be accommodated to the extreme demands of medical technology. In its reconciliation of the humane and the technical, Ronald Reagan UCLA Medical Center is a benchmark in hospital design. The calm exterior embraces the exciting innovation within. Morris Newman has written about architecture for such publications as the Los Angeles Times, Architecture and The New York Times.